Though it's just about August and I've already begun painting some fall scenes, here is a May painting just completed. 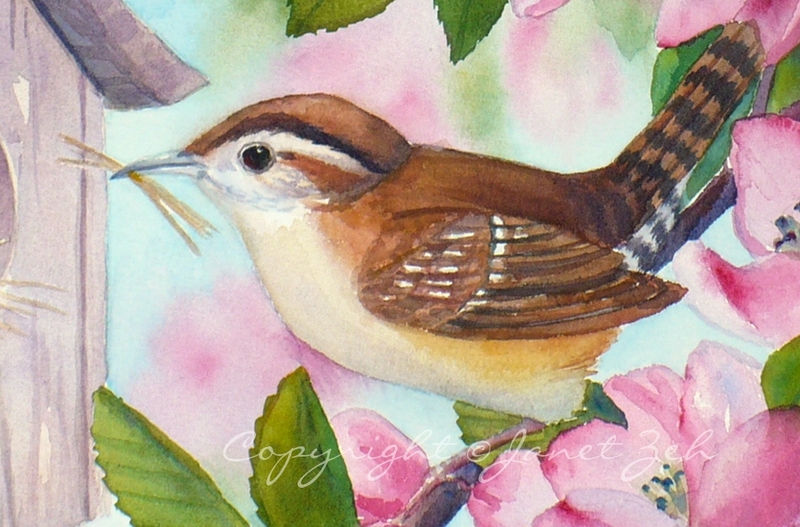 A lovely lady from Canada requested a painting of a wren in Springtime to add to her wren collection. I'm happy to oblige! For years now, I've hung a birdhouse in my crabapple tree. 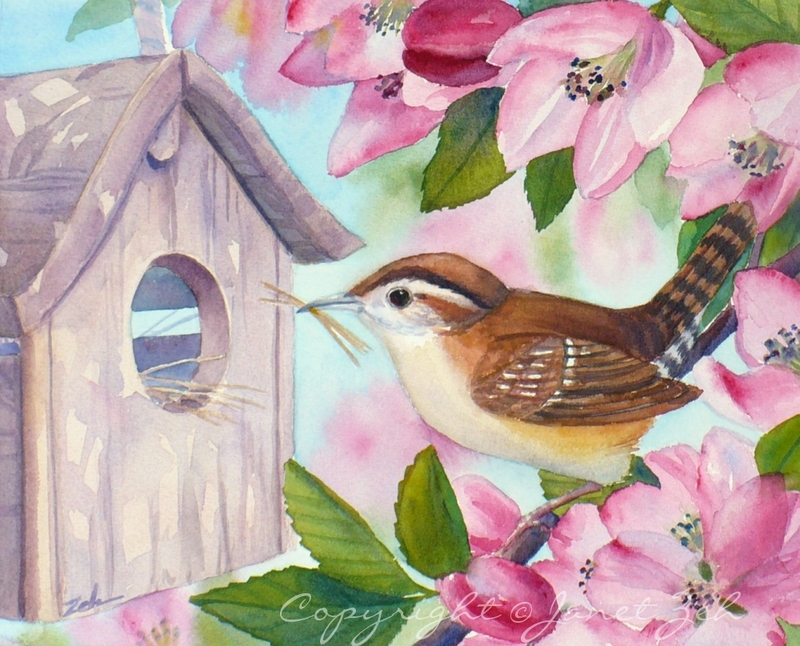 Often it has become the nesting site for wrens. So I decided to draw a composition using this house. 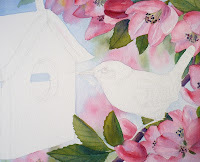 Once the drawing is on watercolor paper, I wash in a background of blue for the sky. 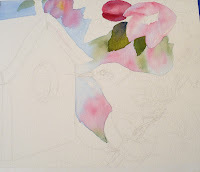 While the paint is still wet, I add pinks and greens right into the blue. They blend into the blue to create soft edges. This makes them out of focus, appearing to be in the distance. 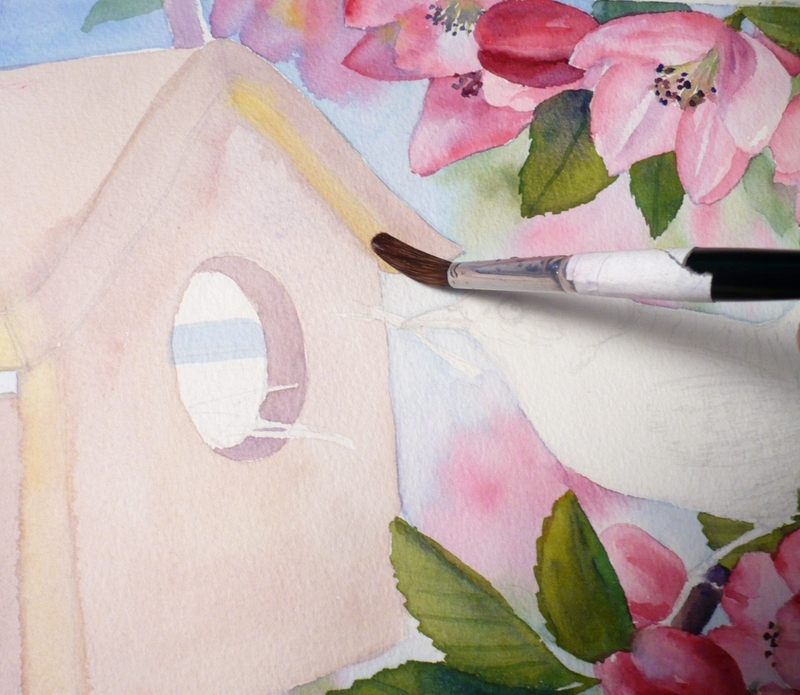 Then I start on the foreground blossoms. 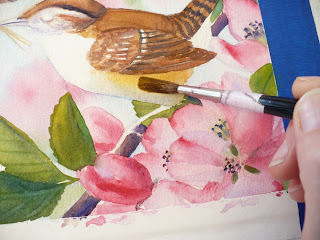 Still using a wet-into-wet technique for the blossoms in the foreground; this time I wet only one leaf or petal at a time. 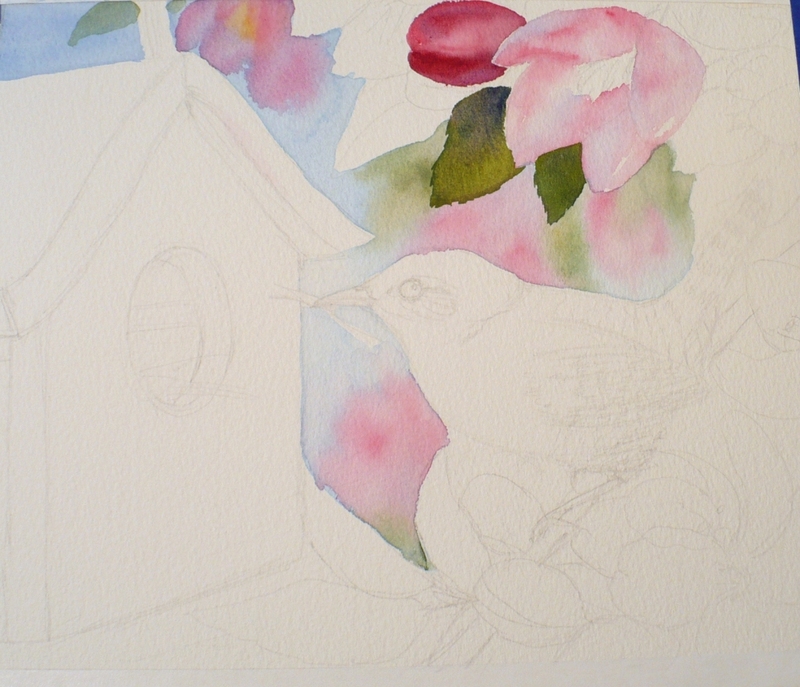 Then I drop in color and let everything dry before adding details. I used a yellow and two shades of blue to make the greens. This makes a more interesting wash than using green paint. Now all the background and flowers are done. You can see, if you click the image, how lovely the washes look under the details in the leaves and blossoms. That is the beauty of wet-into-wet painting. Next I paint the birdhouse, also using a wet-into-wet wash first, let that dry and then paint in details. Finally the bird is painted. Here you can see me painting the belly a yellow color. 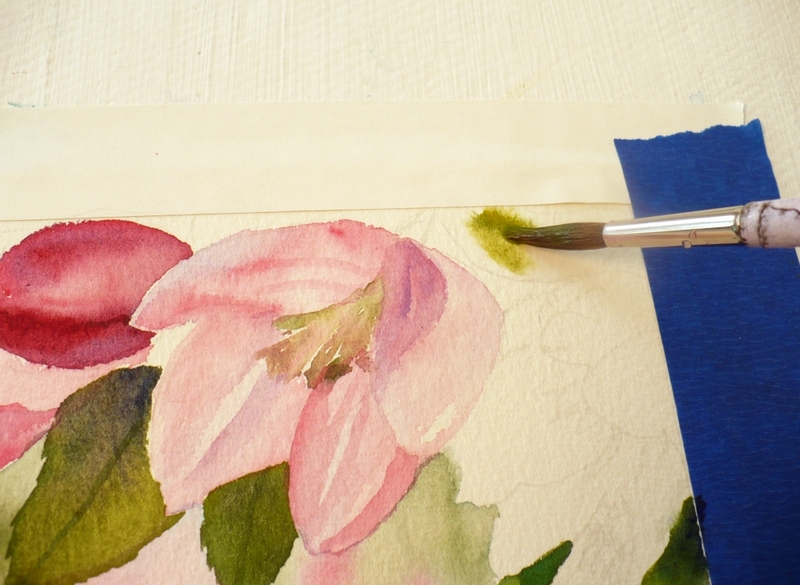 While the yellow is wet, I add a wash of blue under it to indicate shadows. I mixed the brown and black colors from red, yellow and blue. Finished! Little Miss Wren is busily bringing materials to build her nest. Soon there will be tiny eggs, and after that, hungry babies to feed. Thanks for stopping by to see the painting and my process. Hope you enjoyed the demo!